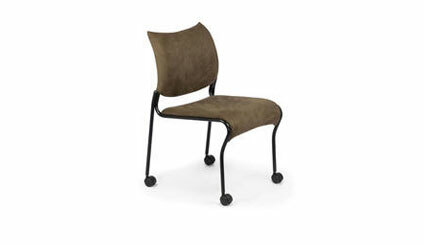 ART DESIGN INTERNATIONAL CAT STACKING CHAIR ON CASTERS | ADI | Alliance Interiors Inc. The CAT without arms is a fully upholstered stacking chair available in regular or recycled fabric, PVC free synthetic leather or vinyl. It is offered with or without a handling grip, on sled base or four leg base on glides with optional casters. A flex back version is also available. A flip-up laminated writing tablet and a dolly are available for this series. The visible metal portions of the seat frame and writing tablet are offered in black, sandex black, chrome, brushed chrome, silver gray, dark grey, light grey or beige. Chairs may be ganged together by means of PVC connectors. I recommend the ADI “Cat” Stacking chair with casters in training rooms, conference rooms, as guest and visitor seating in healthcare or institutional, classrooms, cafeterias and even the home office. The casters allow the user ease of movement while being seated and the chair can be wheeled out of the way or easily tucked away when not in use, The inward curvature of the back hits almost every user in the lumbar area where the most support is needed while sitting. The waterfall edge on the seat allows for the user not to have circulation cut off while sitting for long periods of time. The ADI suspension distributes the body weight easily making for a very comfortable sit for long periods of time. The ADI Cat stacking chair on casters is affordable and I consider it extremely good value for the quality and comfort that you are getting.